This book began its life as Science140, an exciting social media project co-ordinated by four Irish science communicators and enthusiasts including Aoibhinn Ni Shuilleabhain presenter of RTE's The Science Squad, Maria Delaney, Humphrey Jones and Paul O'Dwyer. Since its launch on Twitter in the spring of 2012, thousands of tweets have been collected, each explaining a scientific principle, fact, joke or biography in 140 characters or less. The tweets collected are on a range of topics from astronomy to zoology, and have been compiled by science enthusiasts, educators, members of the public and celebrities from all over the world. Did you know that the Mississippi alligator can stay underwater for 6 hours? 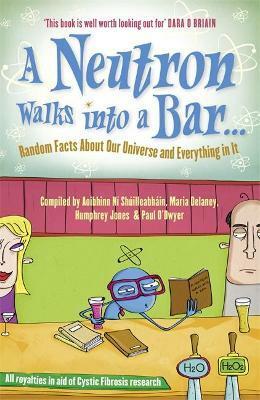 Neither a textbook nor a definitive guide to science, A Neutron Walks Into a Bar... is a fun way to learn new, interesting and unusual things about the world we live in! All royalties in aid of Cystic Fibrosis research. The Science 140 team includes scientist and TV and radio presenter Aoibhinn Ni Shuileabhain, science teacher and blogger Humphrey Jones, dentist Paul O'Dwyer and blogger Maria Delaney.